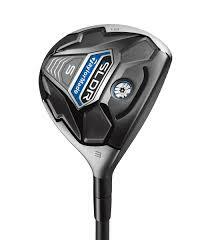 TaylorMade says its SLDR S fairway woods offer a tremendous combination of distance and ease of launch, providing distance for all, regardless of clubhead speed. The Speed Pocket allows TaylorMade engineers to make the face shallower while still maintaining the same high speed as SLDR fairways and Rescues. SLDR S 3-wood’s face is shallower than the SLDR, lowering the CG in lower in relation to the center of the face to make it easier to launch the ball on a high angle. The benefit is a ball high, long-carrying flight that descends on a steep angle for quick, controlled landings. Appears very similar to the original SLDR fairway wood but features a reversed satin silver crown and black face and sole colour scheme. We noted a shallower looking face than before which makes it easier to launch and work the ball. The silver appearance also makes it appear slightly larger in size. TaylorMade logo in the middle aids suitable alignment, as does the black button back on the right of the crown. No glare from the sun, another positive. Two testers didn't think the club sat right at address or feel quite right through the strike. Feedback on mis-hits is adequate but without noticeable twisting of the clubhead. A relatively quiet sound off the face for a TaylorMade metalwood. One tester thought it felt a little shorter than standard in length, while all agreed it felt a tad too light in the hands. A forgiving fairway wood with high launch and low spin characteristics thanks to the low, forward CG on offer, and decent carry numbers but by no means the longest. Easy to hit and get airborne. Lack of adjustability could potentially put some interested punters off. A decent offering from TaylorMade and good value for money if you can work with the light standard shaft and lighter clubhead. Very much light feeling overall, similar to the Callaway Big Bertha V Series we tested earlier, but not quite as controllable. Although a solid performer when putting a good swing on it, and also particularly accurate, feel costs it somewhat in the overall scheme of things.